Here at the brewery we just love summertime – especially with the weather we’ve been lucky enough to get so far this summer! When the sun is shining in Dungarvan there is no better place to be – whether it’s strolling along the quayside, hitting the beach or gowlie fishing in The Lookout, Dungarvan just seems to be thronged with happy people in the summertime. For us, summer is one of our busiest production times as, would you believe, people seem to enjoy a beer when the sun comes out. We get a lot of requests for visits to the brewery during the the summer, from both locals and visitors to the area, which we find difficult to accommodate due to our schedules here. So, this year we have decided to hold dedicated visiting times on Friday evenings at 5pm. 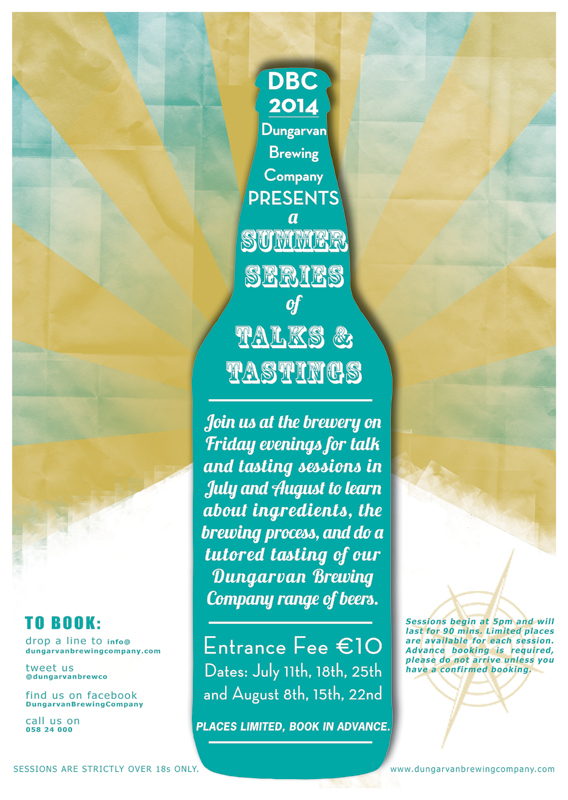 These sessions will include a look at the brewing equipment, a talk on the brewing process and the ingredients we use as well as a tutored beer tasting along with some food pairings including Brewer’s Gold cheese from The Little Milk Company. Sessions will begin at 5pm and last 90 minutes, running on the following Fridays: July 11th, 18th, 25th and August 8th, 15th 22nd. Entry fee is €10. Group sizes will be limited, so advance booking is necessary. Get in touch with us either by email, on Twitter or on Facebook to make your booking. These sessions are for over 18s only. 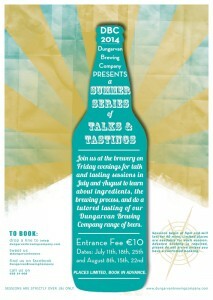 This entry was posted in News and tagged brewery, events, tasting. Bookmark the permalink.